Our office is located in Dawsons Creek Professional Village on the North side of Fort Wayne, IN. It is easily accessible from all directions. The Professional Village is located off the South side of Dupont Road between Lima and Coldwater Roads. Dawsons Creek Blvd. is two traffic lights East of Lima Road (State Road 3) and two traffic lights West of Coldwater Road. The office is easily accessible from I-69 as well. Patients may either exit at Exit 316 (Dupont Road / State Road 1) and then travel West on Dupont Road for about two miles, or they may elect to exit at Exit 311 (Lima Road / State Road 3) and travel North on Lima Road for about two miles and then turn right (heading East) onto DuPont Road and travel about a mile to arrive at Dawsons Creek Blvd. 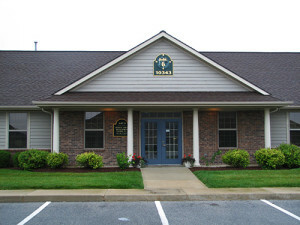 Dawsons Creek Professional Village is located just to the North of the Parkview YMCA.